Over the course of this first year of my asking questions about the pygmy forest I have heard and read many interesting stories about it from some of the people who have been and lived there. This is the first of what I expect to be many pygmy forest stories that will see the light of day here on Lottie's Pygmy Forest Blog. Excerpt of recording from 4-29-16, 4th grade field trip to the Pygmy Forest Reserve in Jackson Demonstration State Forest adjacent to Jug Handle State Natural Reserve. This was designated as the "Pygmy Forest Natural Landmark" in 1969 by the National Park Service..
"When I was going to school at UC Santa Cruz and was going to do my undergraduate thesis, I was trying to think what I wanted to do. I wanted to come up to the coast here and so I called the professor from College of the Redwoods, Greg Grantham. He said "Wow!, nobody's looked at what birds live in the pygmy forest." I said, "Sweet! ", I can go and study birds in the pygmy forest because the trees will be all small, and all the birds will be in the top. It will be really easy. (To the kids)"Do you think it was really easy to see the birds? No! Do the birds just hang out on the top? No". It took me forever just to find... Josh and I were talking earlier about how hard it is sometimes to even find where the pygmy forest is, because it's only in those pockets where that hard-pan hasn't been interrupted. Finally I found the pygmy forest and then I thought I was going to die. I couldn't find the birds. I said, "This is terrible, what am I gonna do? I don't see any birds here." And then, "Once upon a time in the pygmy forest I saw this bird, upside down, eating from a pinecone, and his bill looked like he ran into a window. His top bill bent around so the tip was at the bottom and the tip of the bottom bill was at the top. It's called a Crossbill and the Crossbill does this, he opens his bill that much (Pam indicates a tiny space with her fingers.) so he can poke it into a pinecone. He pries that bill open and with his fat tongue, that he uses like the parrot, he gets his seed out of the middle. 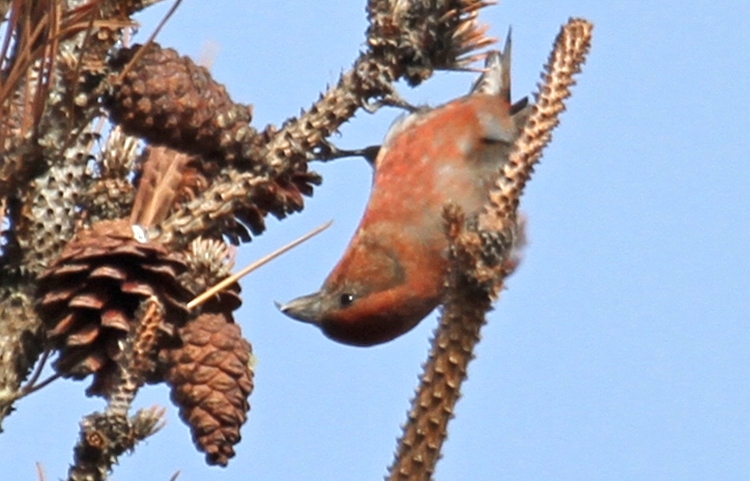 So here is this juvenile Red Crossbill, he's red polka-dots all over, hanging upside down on a pine-cone... and I thought, "A Red Crossbill". And after that I learned that what I was going to have to do was to hear what the bird's song was. That's how I identified... to see what birds live in the pygmy forest." "The pygmy forest has lots of birds. A lot of birds that like to eat bugs are living in the pygmy forest. I found a lot of different species. What I did was to go down and mark their songs, and I came back every month, and I did that for a couple of years to find out what birds are living here. If I was going to do my story I'd tell you the story of the Red Crossbill. Now when I hear his call, "chirp-chirp", "chirp-chirp-chirp", "chirp-chirp-chirp", I always think, "That's my bird", what I call a totem spirit, who says, "Don't worry, everything's gonna be alright"." Pam Huntley is a Mendocino area naturalist and environmental educator who has worked with elementary school children for over 30 years. She has lived in the pygmy forest since 1984 where she caretakes pygmy forest property for the Nature Conservancy and the University of California's Natural Reserve System. When she is not working with the public schools as their nature teacher Pam runs a Nature Day Camp at the Jug Handle Farm and Nature Center in Caspar, California.